The exploding global consumption of meat is implicated in momentous but greatly underappreciated problems, and industrial livestock production is the driving force behind soaring demand. Following his previous ground-breaking book The Global Food Economy, Tony Weis explains clearly why the growth and industrialization of livestock production is a central part of the accelerating biophysical contradictions of industrial capitalist agriculture. 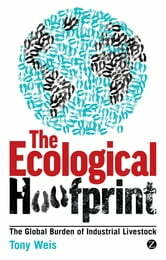 The Ecological Hoofprint provides a rigorous and eye-opening way of understanding what this system means for the health of the planet, how it contributes to worsening human inequality, and how it constitutes a profound but invisible aspect of the violence of everyday life.